“Wind Stalker” is a, well built, well maintained modern sailing vessel, with excellent size and features for coastal and off-shore cruising or weekend live-aboard fun. Small enough to sail single -handed, large enough for a couple or small family to enjoy on extended voyages. 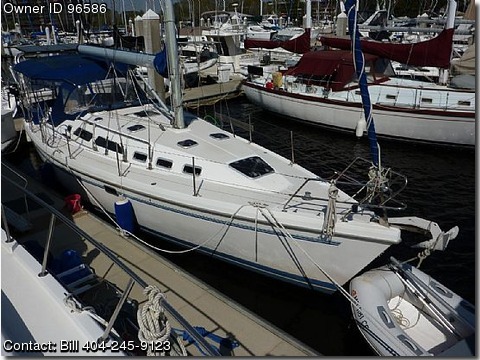 CONTACT INFORMATION: Bill at 404-245-9123 or williamgrobinson(at)bellsouth(dot)net VESSEL: 1998 Catalina 380 Sailboat -- “Wind Stalker” VESSEL DIMENSIONS: 40’ LOA, 38’3” LWL, 12’3” Beam, 5’4” Draft, 58.5” Mast Height above water ACCOMODATIONS: Sleeps six (6) comfortably. ENGINE: Westerbeke 42B Diesel (42 hp), Engine Hrs: 1274 hrs. COOLING/HEATING: Reverse cycle heat pump. Air handlers in salon and master berth. TANKS: Fuel Tank -- 27.5 gallon, Water Tanks -- 60 gallon, Waste Tank -- 20 gal (level indicator on waste tank). MASTER CABIN: Center line queen berth in master cabin. Two large lazerettes for storage. Two large storage cabinets with sliding doors. FORWARD CABIN: V-berth, Storage under V-berth, One hanging locker, Four storage drawers, Sink, Storage cabinet over sink, Storage cabinet under sink. SALON: Two tables available – Dining table & cocktail table, Dining table in salon makes into double bed, Upgraded upholstery, 26” flat panel TV, Mast head mounted, powered TV antennae, Coax switch to allow mast antennae or shore cable TV feed, Stereo radio/CD player, 700 watt inverter (for use with TV or other 115 VAC appliance), Storage bins under seat cushions, Two storage cabinets on salon sides, Ample open storage behind sofa seating, Total LED lighting NAV STATION: Upgraded upholstery on swing out seat, Ample open storage area over nav station, Complete electrical distribution control/monitoring panel, Remote depth/water temperature monitor, VHF radio with DSC programed and filed, Ship’s bell, GALLEY: Refrigerator/Freezer, Propane 3-burner stove with safety solenoid switch, Cutting board cover for stove top, Propane oven with thermostat control, Double stainless steel sink, 3 Large hanging storage cabinets, Under sink storage, Hanging shelf storage , Closet for trash container, LED and fluorescent lighting HEAD: Marine head with manual head pump, Waste tank level indicator in head, Sink, Standalone shower, Added storage lazerette behind head, Storage in shower, Storage above sink, Storage below sink, Doors opening into master berth and salon HELM ELECTRONICS: VHF radio with DSC programed and filed, Remote (blue tooth) VHF radio microphone, Spare remote (blue tooth) VHF radio microphone, Raymarine C-80 chart plotter, Raymarine ST5000+ autopilot, Raymarine ST60+ depth gauge, Raymarine ST60+ wind speed/direction gauge, Raymarine ST60+ boat speed gauge , AIS receiver integrated with chart plotter, Ritchie compass, AIS receiver antennae, Mast mounted VHF antennae DECK EQUIPMENT: Delta (35 lb) anchor, 120 ft 3/8” chain rode, Maxwel windlass with foot switch, Chain locker, Life lines new in 2012, Forward and aft standing rigging new in 2012, All chain plates re-bedded in 2013 – no leaks , All port lights re-sealed in 2013 – no leaks, Stern mounted aluminum arch for solar panels and dinghy davits (2013), Boom furling main sail (full batens), Roller furling jib sail, stern mounted arch with provisions for solar panel mounting and dinghy davits. COCKPIT: Dodger, Bimini (re-sewn and waterproofed 2013), Full isinglass enclosure (2011), Vented propane locker with aluminum propane bottle, Three manual winches (serviced in 2013), One electric winch (serviced in 2013) ADDITIONAL EQUIPMENT: Outboard motor hoist (Kato) at stern, Dinghy davits integrated into aft arch, Two deep cycle 4D house batteries (2012), One deep cycle engine start battery with DC/AC battery charger (2012), Shore power driven battery charger (Xantrex) for all batteries (2010), Shore power cord, 30A, 25 ft, Shore power cord 30A to 50A adapter. NEW SPARES: Engine fuel filters (engine mounted and Racor pre-filter), Engine oil filters, Engine hoses, Alternator belt, Injector, Raw water pump, Raw water pump impellers, Head pump, Spare alternator (new) Solar panels (3 x 140 watt Kyocera) mounted on aft arch: Solar panel controller (Blue Sky MPPT) integrated into battery charging system.